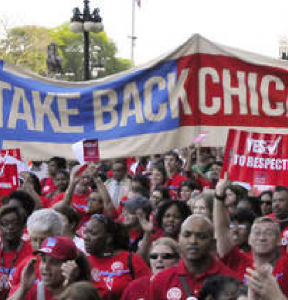 The CTU’s MemberLink Portal is designed to be a safe and secure way for CTU members to interact with the union staff and with the records that the union maintains for each member. Find help accessing it here. Because the security of your information is of the utmost importance to us, registering to use the MemberLink Portal requires that you prove your membership based on unique personal information that needs to match the data held in our member database. For that reason, some members have had difficulty registering in MemberLink for the first time. Below are instructions to help people who may be experiencing difficulty. In order to retrieve your login information for the MemberLink Portal you will need to provide the system with the email address that CTU keeps on file to reach you. In order to register for the first time you will need either your Board employee ID or your CTU member ID (not both). You will also need either your primary phone number on file with the CTU or the email address on file with the CTU. If you have not verified your email address or phone number with the CTU, you will need to phone 312-329-9100 during office hours (9:00 a.m. to 5:00 p.m.) and ask for the Financial Department. » Skip to help for first time registrants. Depending on whether you are logging in on a desktop computer or a mobile device, your login screen will look slightly different. However, the procedures for registering and for recovering your username and password will essentially be the same. If you remember your username but not your password then choose the “Forgot your password?” link. 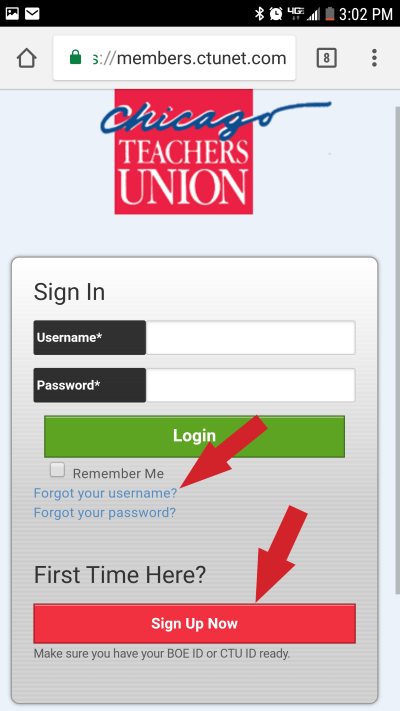 If you cannot remember the username that you chose for yourself when you first registered, click the “Forgot your username?” link. An email with instructions for recovering your username or password will arrive in your inbox. There can be a significant delay in receiving the email with your recovery link—especially when many people are logging into the system—so, please be patient. The registration process can be slightly tricky, so please follow these instructions closely. The screen below for first-time registrations will look essentially the same on either a desktop or mobile screen. In the first section, be sure to use your name as it appears in our records (i.e. as it appears on your CPS records and/or on your CTU membership card).
! The second and third sections can be tricky! Choose one or the other piece of requested information in each of these sections. If you enter your primary phone number in the first field of the second section then do not enter your email. If you enter your email, do not enter your phone number. Entering both will cause the system to reject your registration. Likewise with the third section: If you enter your Board of Education employee ID number then do not enter your CTU membership number. Of course, the reverse applies. 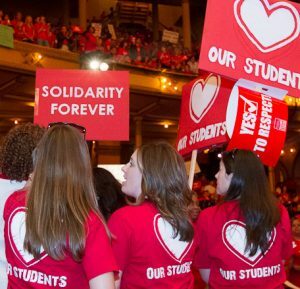 You may enter your CTU membership number, but you must leave the BOE ID field empty or the system will reject your registration.
! 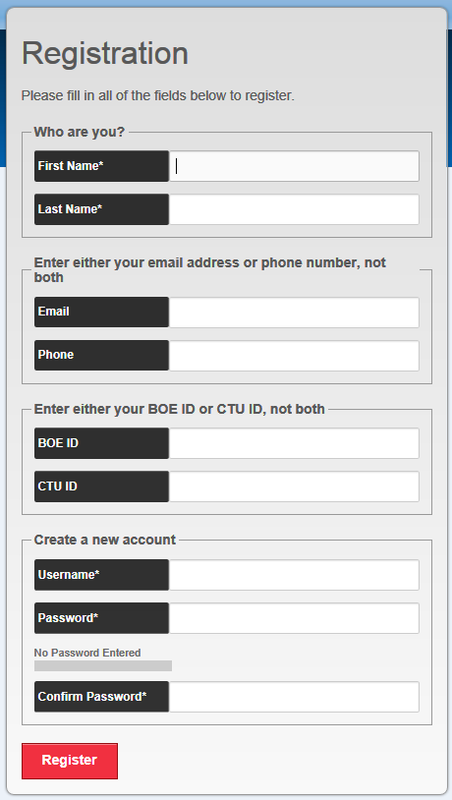 Your BOE ID is recorded in the CTU database as five or six numerals. If your Board ID starts with a series of zeroes, leave the initial zeroes off (e.g. 000012345 —> 12345). The CTU Member ID is only composed of (five or six) numerals. You may see letters on your membership card next to the member ID. Those letters indicate your functional group and delegate designation. The letters are not part of the CTU ID. Use only numbers in that field or your registration will be rejected. Finally, you will be asked to choose a username for yourself and a password. You will then need to re-enter the password to ensure you did not mistype it. An indicator will show whether your password is strong enough to secure your personal information. If you have read and used these instructions, but are still having trouble logging into the system, please email Nathan Goldbaum in the Communications Department or call him at 312-329-6252.